If you’ve never hired a personal chef for a private event such as a dinner party, you might have some questions about the process. Read our FAQs here. Who hires a private chef? A range of people enjoy my private chef services, including busy professional couples, time-poor families who wish to treat themselves, and people who want to host a special occasion and enjoy their guests. What does a private chef cost? Each menu and event is completely bespoke and quotations are provided on receipt of the client brief. Our traditional French menus start at £45.00 per person for a minimum of six guests. 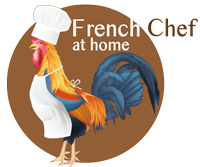 French Chef at Home prices are inclusive of all ingredients and the chef’s time in your kitchen. We ask for £100 deposit in order to confirm and secure the booking. The full amount must be paid one week before the event. French Chef at Home uses all fresh ingredients that are all sourced locally in Yorkshire, and are organic wherever possible. A selection of our ingredients are brought from France when we visit our home country. I would be delighted to discuss my ingredients with you in more detail when we create your menu. Do you provide crockery, linen, cutlery and glasses? Most clients prefer to use their own, but we can provide the above for small dinner parties. There is an extra charge for this service. How long with you be in my kitchen? For three-course meals and more, it is likely that I will be creating various courses from scratch. This will take several hours in most cases, but we can make arrangements for this to fit with your schedule – for example, I can start cooking while you are at work. What should I do to prepare for your arrival? Please have a clean kitchen and empty sink with room in your fridge and freezer, as well as a working space for French Chef at Home to work. Also make sure your oven and gas are working. We can cater for up to 50 guests. For dinner parties of 6 people or less Yves will cook and serve the food. For parties of over 6 guests we can provide a professional waiter at an extra cost of £15 per hour (inclusive of VAT). Am I restricted to the menus provided on the website? No, all of our menus are completely bespoke. The menus on the website are only a guide. We can tailor your menu to the tastes and preferences of you and your guests. What’s the French Chef at Home cancellation policy? We take a £100 deposit from clients on receipt of their booking confirmation. The balance of the cost of the party is due one week before the party. Cancellations made up to a week before to the event will receive 50% of the deposit back. Cancellations later than a week before will not be refunded. How do I book French Chef at Home? Call us on 07423 746 080 for a no obligation chat about your private chef requirements, or fill in enquiry form on this page.